With A-list celebrities among its followers and a string of unsavoury allegations from former members, the Church of Scientology is rarely far from the headlines. But newly released government files from the National Archives at Kew show controversy surrounding the church in the UK is nothing new. In the 1960s and 1970s officials debated whether or not to lift a ban on foreigners entering the UK to work or study at the church. In the documents, high-ranking mandarins referred to the church as "evil" and some described it repeatedly as a "cult". Many of the documents discussed a series of lawsuits filed by the church in the years after the entry ban was introduced in 1968. Set up in the United States in 1954 the church, according to the files, started to spread to the UK in the 1960s. It offered self-improvement on the basis of the writings of the late science-fiction author L Ron Hubbard, who spelled out principles that he called Scientology and Dianetics. Back in the 1970s government files revealed the church had gained a reputation for targeting critics, as well as mistreating and exploiting members. At that time the government was considering its position in relation to Scientology and whether its entry ban was still valid. 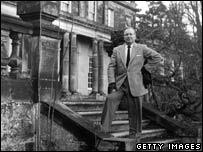 A report into the church by Sir John Foster had argued it was wrong to exclude Scientologists when there was no law preventing them becoming UK citizens. But the files showed some in government did not agree. A confidential report produced by the then Department of Health and Social Security in 1977 for Home Secretary Merlyn Rees stated the church was a "considerable evil". It was written as the government prepared to defend itself against a number of writs filed by the church relating to a 1968 statement announcing the entry ban. The document stated: "The effect of losing the actions could of course be grave, not only for the defendants, but as giving some seal of respectability to an organisation which is essentially evil." Some of the evidence it would have used in its defence against the writs was outlined in the report. It included an allegation that the church at its UK headquarters in East Grinstead, Sussex, took in young English people with a history of mental illness. The document said the young members paid fees of £450 and £500 before being classified as trouble-makers and put out on the street after suffering breakdowns. It also said the church created family discord and broke up marriages, referring to a six-year-old who was declared a "suppressive" because she would not leave her mother. The document also talked of "vicious and barbaric" punishment for members who neglected their duties. It said some were forced to carry out menial jobs with no sleep for 48 hours, with a 15-minute break every six hours. Others had been imprisoned for 48 hours in a hatch too small to allow them to lie down or stand up, the document said. The report also said members had been instructed to carry out "noisy investigations" on any critics and that any person classified as an "enemy" was considered "fair game" by the church. The document said such a person may be "deprived of his property by any means, be tricked or sued or lied to or destroyed". The report's author urged the home secretary not to change the law regarding Scientologists because it could weaken the government's case at the libel trials. Elsewhere in the files another document said the church was "an organisation designed to make money, and perhaps also gain power". It said the church alienated young people from their families "obtaining large sums of money for its courses on the strength of wild claims that they can cure all sorts of physical and mental ills". The file contained correspondence between the lawyer representing the Scientologists in the UK and the government. It also has adverts and pamphlets distributed by the church at the time. One leaflet proclaimed "Your personality is the key to your future success and happiness" and urged people to take a free "personality test" at the Scientologist church on London's Tottenham Court Road. 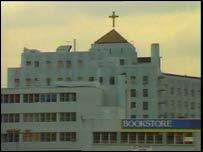 The ban on foreign Scientologists entering the UK was eventually lifted in 1980 but an uneasy relationship between the church and the authorities remains. The church is still not classed as a religion by the Charity Commission and wants its status changed. 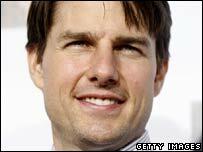 Critics have claimed it is a fake religion based on making money from its followers, which include film stars Tom Cruise and John Travolta. 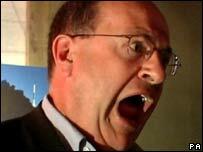 Earlier this month Scientologists released a video of BBC reporter John Sweeney screaming at a member during a Panorama investigation into the church. A spokesman for the church in the UK attacked the newly released government file, saying it was "an old document based on no evidence". "The ban was lifted in 1980. Obviously these inflammatory allegations were not true," he said. "If just a fraction of the outrageous allegations made about Scientology were true, it would not be here today." Cult or religion: What's the difference?